I can almost guarantee you grew up with your folks telling you to finish your vegetables. When you were hungry and wanted a snack, have a piece of fruit, was often the answer. We know without a doubt that vegetables are an absolutely essential part of our daily Paleo diet, but what about fruit? How does fruit weigh up against vegetables and are they just as important? 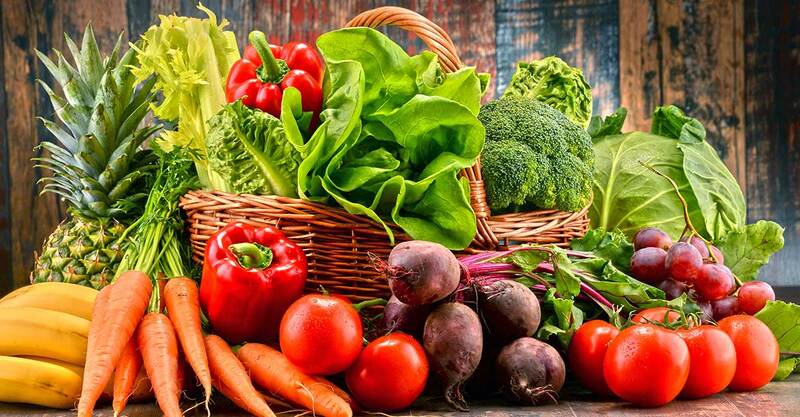 A vegetable is the part of the plant which is edible to humans but it does not have a part to play in the reproduction cycle of the plant. A fruit on the other hand is actually defined as the ripened, mature ovary of a seed plant, which usually develops from a flower (1). This is all very helpful, except many vegetables such as tomatoes, avocados and cucumbers are actually fruits and not vegetables. The reason for the confusion is usually to do with taste. In terms of taste fruit is normally sweet and vegetables are not, so through the ages people have naturally grouped them according to taste. You can tell, just by the taste of most fruits, that they contain a fair amount of fructose. Is this a problem on the Paleo diet where we cut out all processed sugars? What else do they bring to the table? The wonderful thing about mother nature is her ability to communicate certain things with the use of color. When it comes to fruit, each colour tells us a different story. A story about different vitamins, antioxidants, fiber and benefits associated with that specific fruit. The deeper and more intense the colour, the higher the antioxidant content. Fruit which has a distinctive sour taste along with the sweet tells us about bucket loads of ascorbic acid, or vitamin C in normal peoples language (2). Of course fruits looked completely different during the Paleolithic era. They were most probably not as big, and they were definitely not as sweet as they are today. For this reason it is best to consume fruits with caution and concentrate more on having fruits which are on the lower end of the fructose scale. When munching on your favorite fruit, keep in mind, that fruit will have a strong effect on blood glucose levels. For this reason if you are overweight, have insulin resistance or diabetes, it is best to initially cut out fruits or at least limit them to one low sugar fruit per day. One of the underlying philosophies of switching to a Paleo way of life, is increasing the nutrient density of each meal with fiber-rich vegetables. Fights constipation:Lifestyles like the Paleo philosophy encourage bucket loads of vegetables to ensure that you are receiving adequate doses of nutrients and to help replace the grain that you were use to having on your plate. This increased fiber ensures that your bowel movements are regular and you will not suffer from digestive issues like constipation. Slows down digestion of food: Fiber aids in controlling the release of glucose into the blood as it slows down digestion. This also aids us in feeling fuller for longer and therefore helping with appetite control. Here’s the thing though, many of the nutrients in vegetables are only really absorbed if eaten along with fat. Vitamin A, D, E and K are fat soluble vitamins and therefore if you are not eating enough fat, you are not benefitting properly from all the veg you are eating. Many people are worried about navigating the confusing gauntlet about which fruit and vegetables to practice caution with in the Paleo lifestyle. Remember one little rule: if it tastes sweet then it is sweet. For example, if you compare grapes and strawberries; grapes are incredibly high in sugar and strawberries are delicious but without the insulin spike. Again, its therefore much safer, and better for your blood glucose levels to rather stick to the strawberries. When it comes to vegetables; sweet potato and peas both taste much sweeter than broccoli. Its easy then to remember that broccoli can be eaten without a worry, however sweet potato and peas need to be thought of as carby vegetables and therefore eaten with caution and with thought to their carbohydrate content. Find a comprehensive list of low carbohydrates vegetables here. Its quite clear that each fruit and vegetable brings something unique to the table (excuse the pun). Fruits and vegetables can be thought of as functional foods in that they contain biologically active compounds which interact with our bodies and improve our health. Vegetables are vital for our health and should be enjoyed with each and every meal. Fruit on the other hand is just as vital, however to be enjoyed with thought to your blood glucose profile, your weight loss goals and finally your activity level.